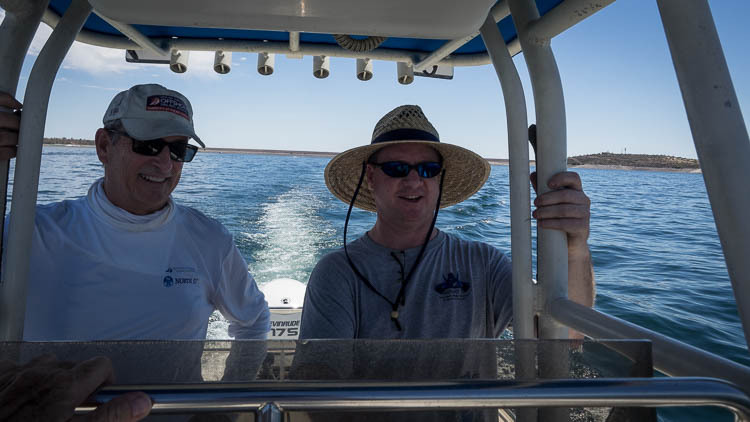 Dave Perry spent Birthday Regatta Saturday, February 9, buzzing around Lake Pleasant on David Newland’s powerboat, shooting video of your sailing with simultaneous commentary. Scary, right? Well, yes, and fun. And highly educational. The video is on Google Drive, so it’s best to view it on Chrome. I encountered a limit to the number I could view until I downloaded the vGet browser extension. That seems to work. Click here to go to all the information about the February 8-10 Birthday Regatta & Leukemia Cup. 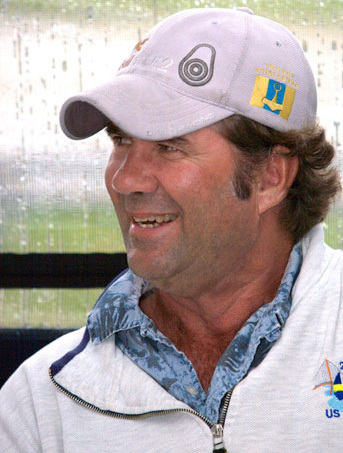 International racing expert and speaker Dave Perry will headline the 2019 Birthday Regatta & Leukemia Cup. The Birthday Regatta & Leukemia Cup is nearly here and we have 69 boats racing and more than 220 people coming to the Saturday night dinner. The event is headlined this year by sailing expert Dave Perry, who will present two seminars—one on Friday night and then a clinic Saturday night. 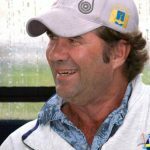 Get racing tips Friday night and then see how well you followed his advice when he offers video of the day’s racing Saturday night. 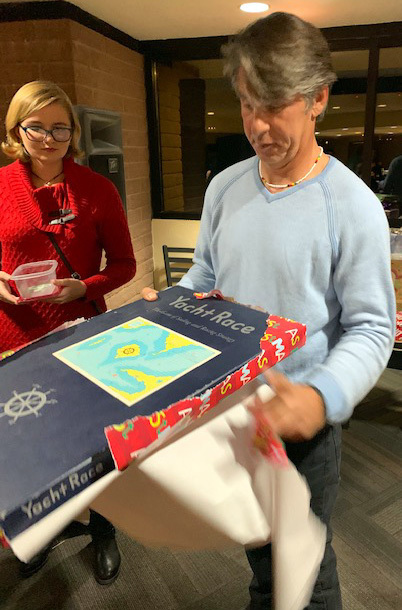 In addition to great racing, the regatta this year will feature (we pledge) the best Saturday night dinner in AYC Birthday history, catered by Arizona Taste. All in all, it’s an event not to be missed. 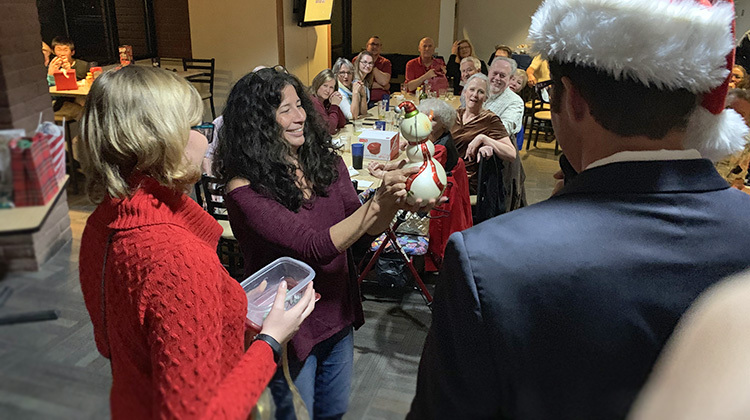 A big, festive crowd turned out for the December AYC Christmas/Holiday party (12/11), with over 50 gifts tossed into the Buccaneer Gift Exchange. Commodore Santa Rob Gibbs presided over the madness, and as usual, the favorite gift of choice was a bottle of something containing alcohol. 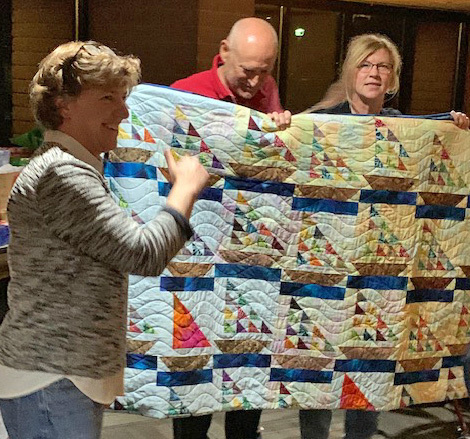 Since we’re getting a jump on the Birthday Regatta & Leukemia Cup auction, Maryellen Ferring auctioned off a handmade quilt created by Cindy Pillote’s mother, with the proceeds going to the Leukemia & Lymphoma Society. Debbra and Emory Heisler were the high bidders at $1,000. People also bought a couple dozen Birthday Regatta souvenir technical shirts and various other silent auction items. 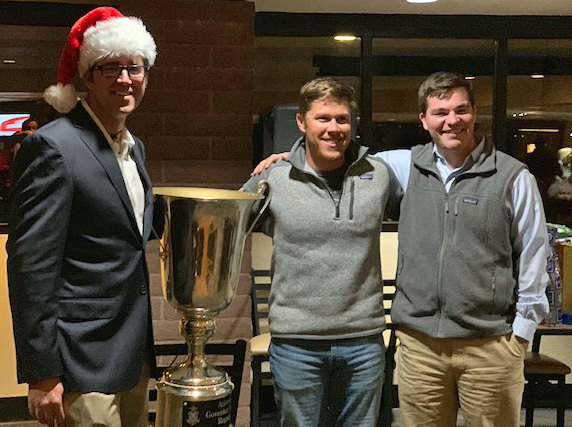 Rob also presented the giant Governor’s Cup trophy to Joel Hurley and crew Grant Younger and quickly declared Ye Blunder Bucket voting over by choosing George Tingom as the winner for not showing up or returning the Bucket for this round of voting. Remember your other Blunder nominations for the next round at the Commodore’s Celebration in May. 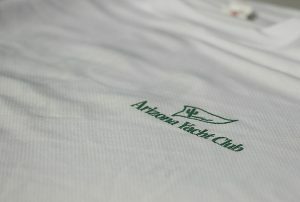 The 2019 Birthday Regatta and Leukemia Cup shirt front with the AYC logo. When you sign up for the February 8-10 Birthday Regatta & Leukemia Cup, be sure to outfit the crew in souvenir technical shirts. In fact, you don’t have to wait until you sign up (since we know that’ll be at the last minute). We’ll have the shirts available at the Christmas gift exchange on Tuesday night (12/11). 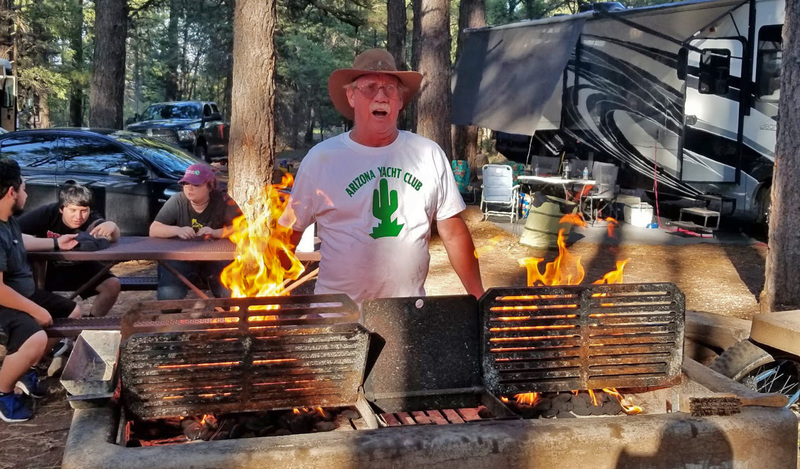 The graphic on the back of the shirt was drawn by Bob Downer, a cleat hitch around that Arizona landmark, the saguaro cactus. The shirt itself is a comfortable wicking technical shirt that usually sells for much more than the $20 you’ll spend for this beauty. 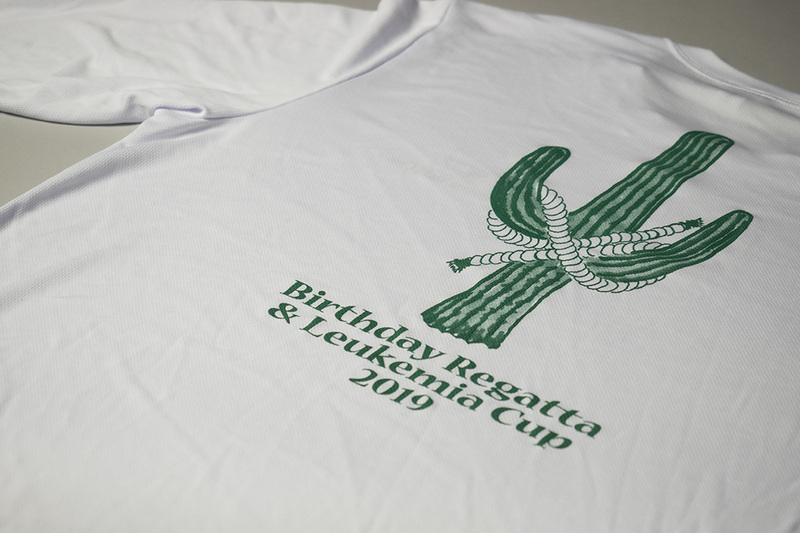 The 2019 Birthday Regatta and Leukemia Cup souvenir technical shirt with graphic drawn by Bob Downer. 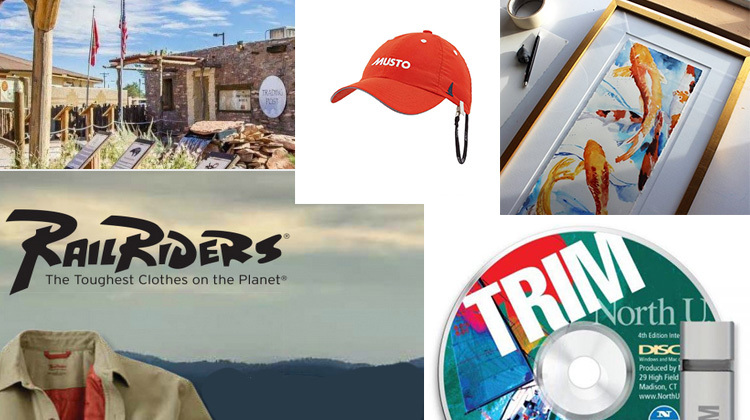 Some three dozen items will be in the 2019 Birthday Regatta & Leukemia Cup silent auction, but you won’t have to wait until February to snag one of them. All of the auction items are available right now at the “Buy Now” price. Simply email Maryellen Ferring (who gathered them all with some nice help) and tell her what you’d like. In addition, she’ll be bringing some of the items to the monthly meetings in December and January so you can see them and either bid on them or grab them for the “Buy Now” price. 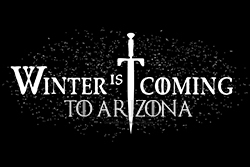 The December meeting is December 11 at the usual spot, Rolling Hills Golf Course, 1415 North Mill Avenue, Tempe, AZ 85281-1205 (map) and both members and non-members are welcome to attend. Arrive early enough to bid. Here’s the list of items. Proceeds from the auction will help defray the cost of the regatta and some will be donated to the Leukemia & Lymphoma Society. 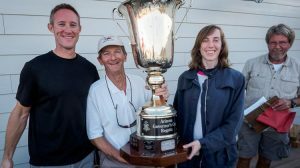 Much more information on the 2019 Birthday Regatta & Leukemia Cup here. A collage of a few of the 2019 Birthday Regatta & Leukemia Cup silent auction items. 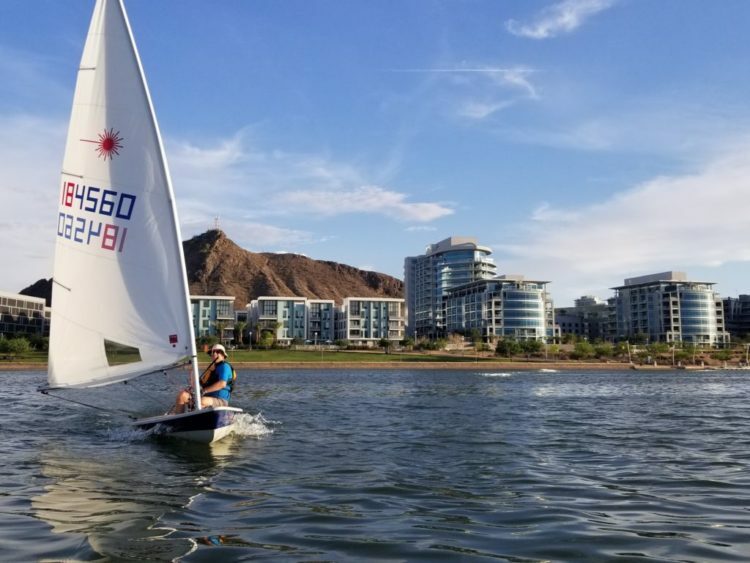 AYC Lake Pleasant Lake Captain and J/70 crew David Newland this Sunday (11/11) did a foolishly brave thing: after never before sailing one, he adopted a Laser and went sailing at Tempe Town Lake in heavy, puffy wind. Crazy maybe, but he decided to, mmm, take the plunge. Overweight and out of shape, I decided to sign up for Bowline Cross Fit. I felt very intimidated when I arrived and saw Hurley crunching 100 sit-ups, Bernard bobbing and weaving the double-end boxing bag and Gibbs speed-skipping the gym rope. Wait, did I say Bowline Cross Fit? I meant Laser racing. In the late 70s, I spent many weekends motoring around Marina del Rey in my little Whaler. I liked to idle down and spectate when the kids were racing Lasers in the harbor. It looked like a ton of fun and I was quite envious. Getting hooked up with them never materialized. Well, five decades and 120 pounds later (maybe 130), I got my chance! The weather forecast was on point this past weekend, so I reached out to Grant Younger to get signed up for an Adopt-a-Boat. He helped me pick out my weapon of choice and Joel Hurley helped me rig it (and de-rig and re-rig the items I thought I knew how to do without any instruction whatsoever). OK, so far so good. Winds were blowing 20. KPH. Felt like MPH to me (And sometimes was –ed.). I got the Laser launched and was overly confident with the stability of this 2×4. 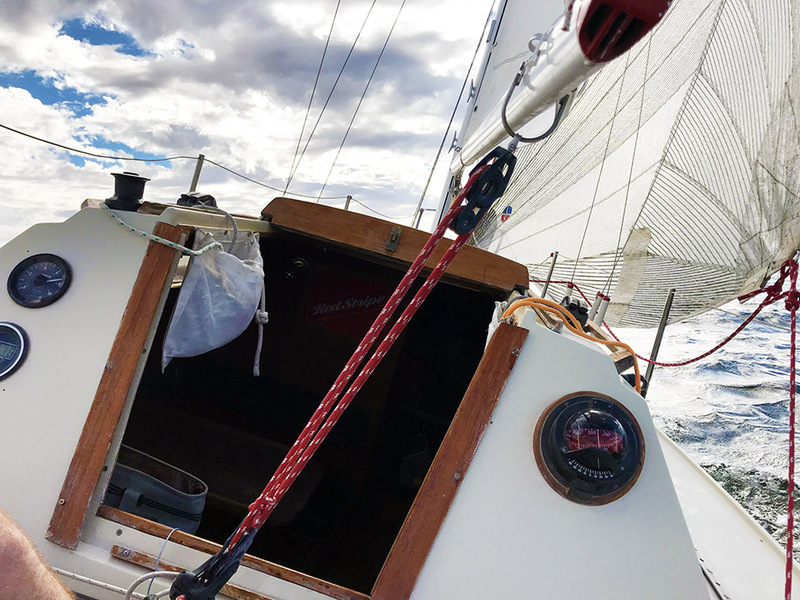 Maryellen Ferring was helping with the bow line and just as she said, “don’t step on the…,” I stepped on the foredeck, and was immediately in the water. Note to self: That’s the wrong way to board a Laser. What transpired during the next three hours was quite the combination of emotions. Mostly fun. Lots of laughs out loud to which the spectators on the shore and in manually-powered craft (to which I gave right-of-way) probably thought I left my medication at home. Frustration. Mostly because I was envisioning my younger self in MDR. I just can’t duck the boom as efficiently as I probably could have 40 years ago! Surprisingly, I did fine. I still have all my teeth and no concussion symptoms yet. Anxiety. That moment when you (okay, I) lose the tiller and the main sheet at the same time, knowing that capsizing is imminent. Thanks, Joel, for retrieving my hat. Did you see my Oakleys? Let me digress for a moment. The wind was blowing. I faltered. 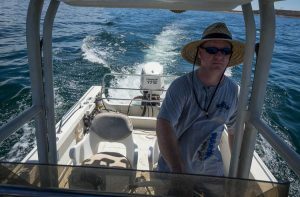 Joel, from his cockpit, was able to maneuver his boat to help start my righting process, fixed some issue with my main sheet, located my hat, and then sailed off. I survived. Quite well actually. I wasn’t a worthy racer, but I knew going in that racing wasn’t going to be my priority. It was getting my feet wet (and every other body part) with the Laser Fleet at TTL. What a great group of sailors. And thanks to Adopt-a-Boat for the opportunity. Thank you Race Committee, as well as Toyota Motor Company for making a fantastic waterproof key fob, and to Bayer, maker of Aleve. Oh: my disembarking. Yup. Cannonball! No more Laser foredeck for me. YOUR Arizona Yacht Club is a great club with a host of vibrant social and sailing activities. From Racing to Cruising to just hanging out, it is a group that I’ve really enjoyed being a part of for over 13 years now. It didn’t get that way by the work of just one or two people, and it won’t continue to grow through the work of just one or two people (or even 10-15 people). The BIG ASK of YOUR Club is that you find one thing we do that you are interested in, one thing that you would be willing to help out with and say YES! Give back to your friends and YOUR Club. YOUR Board of Directors has some focus areas we are working on that are important to the longevity of the club. We can’t do all of the work it is going to take to accomplish these goals alone. YOUR Club has events that need organizing and support. Just find one way this year to participate a little more. YOUR Club is more than a membership card. YOUR Club is built on the relationships between its members. Relationships are what keep us coming back year after year. Relationships are also give and take. 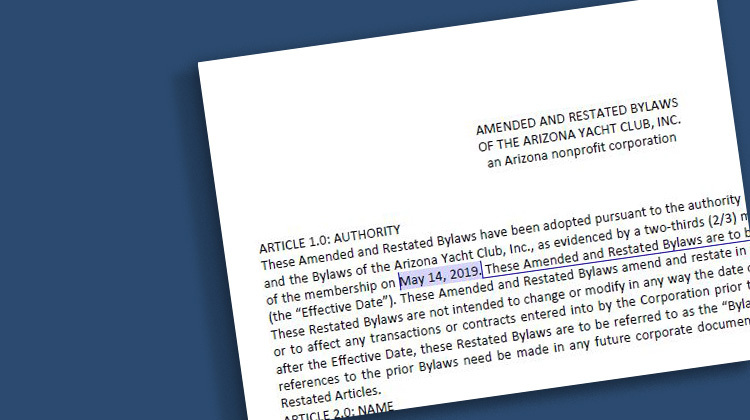 In order to continue to succeed and grow as a club, YOUR Arizona Yacht Club needs you to give a little back. The more you give, the more you will receive in return because you have helped sustain us into the future! 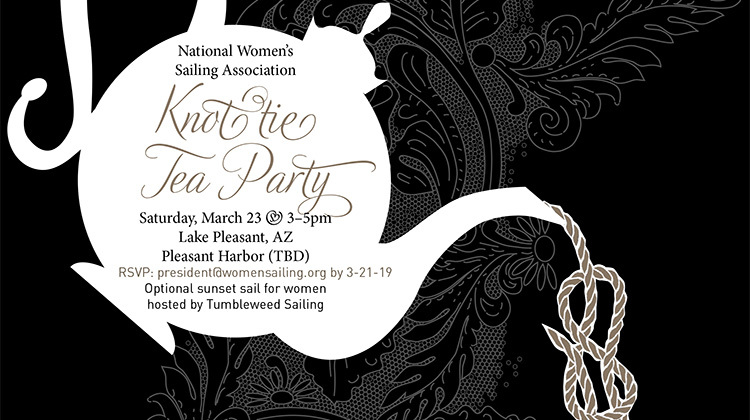 Thanks in advance for supporting YOUR Arizona Yacht Club! In 2018, AYC membership is higher than ever, with 235 member families as of June 1. 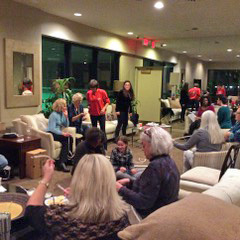 We have active series at two lakes, well-attended monthly meetings with interesting speakers, a nonprofit arm in ASF with sold-out adult classes and well-subscribed kids’ classes, and large entries in the Birthday Regatta, Governor’s Cup, Tall Cactus and Ruth Beals Cup. We have high-level equipment to run our races. Our club communication, event registration, and governance are all excellent. Yet, it’s smart to look for ways to improve. Is our membership getting gray? If so, how do we recruit and engage younger members and their children? While registration for “event” races is very good and series entries are still strong, not as many boats are showing up on the race course. How do we get more out? Commodore Rob Gibbs has set up four committees to create various initiatives to strengthen the club, including one aimed at building the racing program, which I think is the core of the club. Below are some thoughts, a combination of my own and those of a group of hard-core racers we pulled together for an hour recently: George Sheller, Martin Lorch, Joel Hurley, Skip Kempff, and Scott Richards. If you’re looking for solid answers, this is not the place. These are mostly questions and perspectives rather than answers or prescriptions. Here we go. Sailing has always been a minor sport, especially away from the coasts. 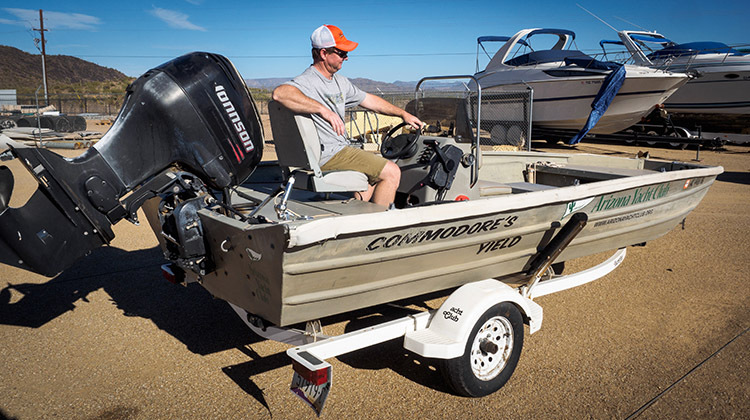 Boat sales have been low for years. Participation in sailboat racing is dropping nationally. There is increased fragmentation of all leisure activity. There is general reluctance to commit time to any single activity. Natural life cycles bring people in and out of sailing: career, kids, retirement, travel, health and fluctuations in disposable income. Time commitment required for series racing. Knowledge of the sport and its rules and the ability for new people to join the action. We now have more racing than at any time in the club’s 60-year history. 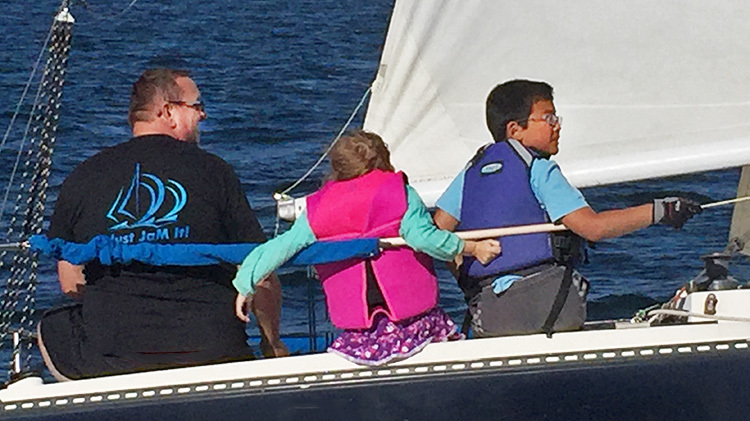 Sailing in every event (as some of us do) requires a considerable time commitment. 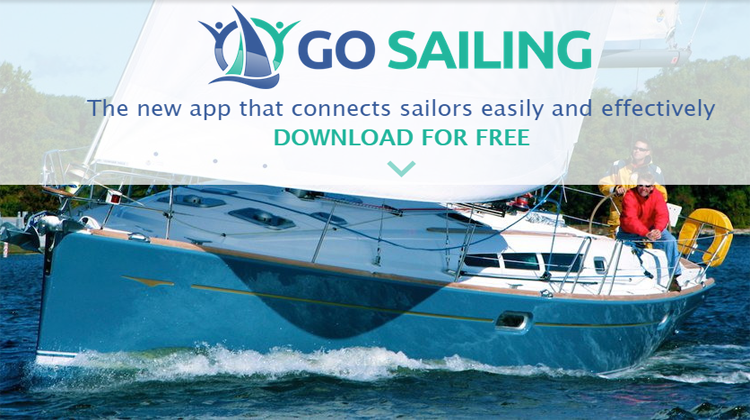 It also spreads our available entrants and boats across more sailing choices. Choice is good, right? Options are good, especially in an era when there’s so much competition for our time. But it also means we’ll probably have fewer boats at each event. 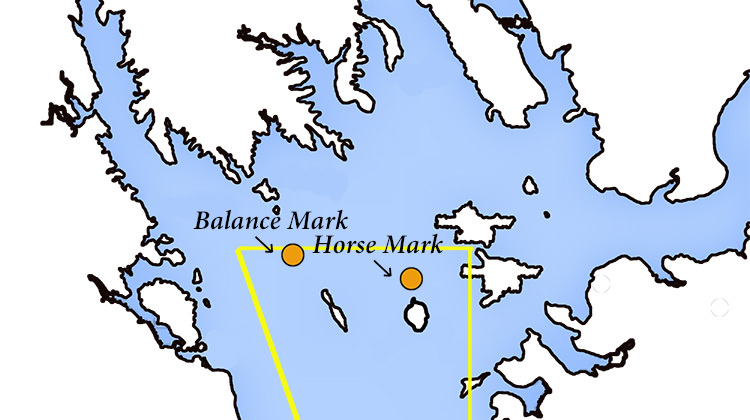 This is seen most clearly in the spring and fall race series. 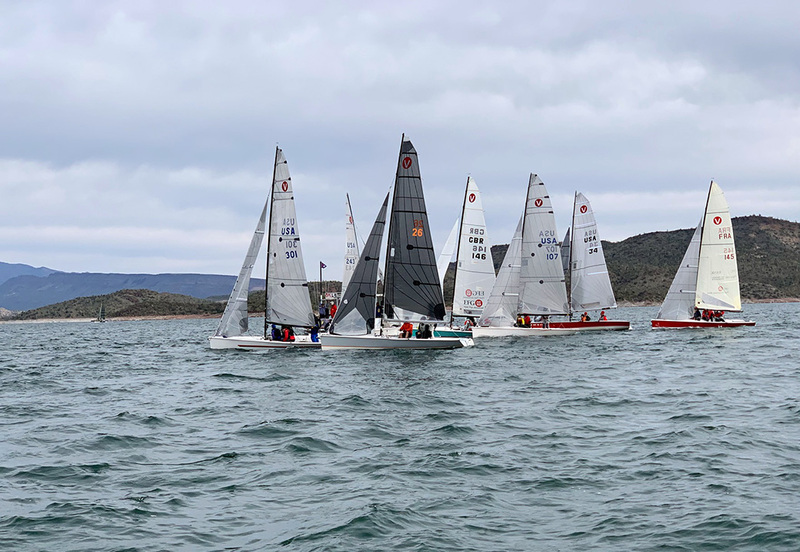 At Lake Pleasant, Catalina 22, Multi-hull, and JaM fleets are scoring (and racing) Saturday only. 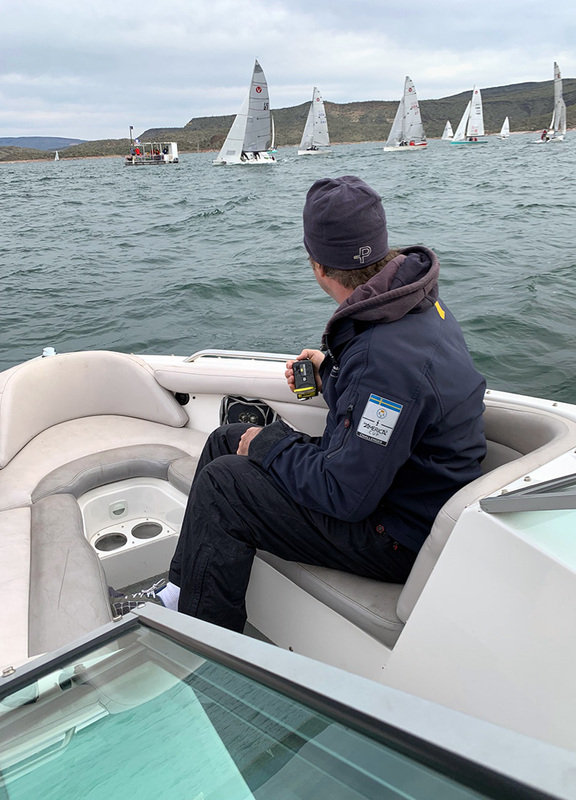 On Sunday morning this spring it was not unusual to have 2-3 Thistles, 2-3 Sport Boats, and a half dozen Spins on the water. If one of those fleets was on RC, the numbers dropped. At TTL, we saw 4-6 14.2s, 4-6 Lasers, and 2-3 Portsmouth… and one of those fleets was always on race committee. Do we need to increase throw outs so more people will participate? Or do throw outs simply mean “I don’t have to show up”? Is a season championship an outmoded concept? No one has proposed a good answer. Members of our group noted that missing a weekend means giving up a good finishing position. You have to show up to place in nearly any of the fleets. Since it’s difficult to make all the races, do entrants simply give up and not bother to race other weekends as well? Instead of more throw-outs, is there a way to use the redress model and give missing racers an average of their other scores? What is clear is that the one-day events (Beals, Governor’s, Tall Cactus) are working and appealing. They’re a small commitment, casual, and social. It’s a winning concept. But this caution: these events work partly because they’re unusual and special. Adding more would doubtless reduce the numbers for each. We frequently hear skippers say they can’t find crew and we hear people who want to crew say they can’t find boats on which to sail. Clearly this is an issue we need to fix. The group said we need to know more about the crew list people in order to decide whether to consider them. Possible answer: adding questions to the form and perhaps vetting all crew-list additions by phone to find out more about them and clarifying their commitment. The key requirement for regular crew: to show up on time, every time, ready to race. Could we have a pool of people who would commit to sail on a given weekend and then make sure they get on boats? 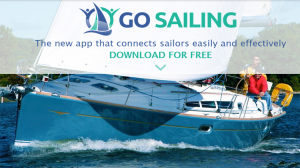 Would the new Go Sailing app help? Sailors need boats and often new people don’t have boats, can’t afford boats, or aren’t ready to commit to a particular kind of boat. If they can’t crew, they drift away from the sport. The adopt-a-boat program has been a boon, getting people onto boats who wouldn’t otherwise be able to sail and simultaneously strengthening the 14.2 fleet. But it has its limitations: people want to sail at times when the adopt-a-boat program isn’t operating. Is there a way to overcome this? Is there a way to create a parallel keel-boat program? Would it be possible, for instance, to field a Tumbleweed Catalina 25 as a JaM entry with newbies onboard? Could we find a way to put a Catalina 22 or Santana 20 in play? 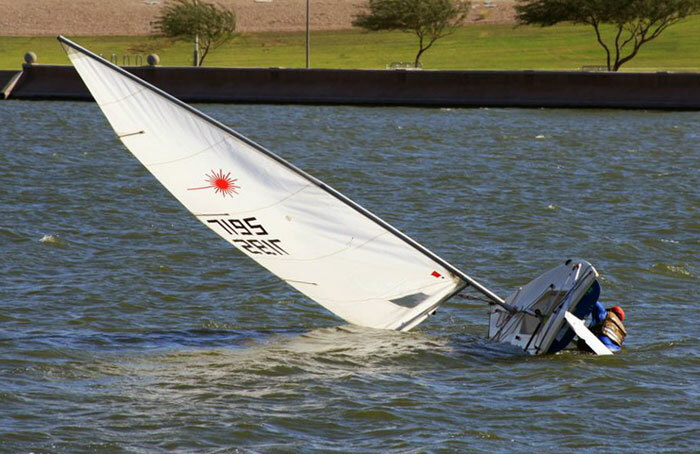 What about getting the juniors on board a keel boat for Lake Pleasant racing? Why don’t people get their boats on the water? Many, including some board members, don’t do it. This might be a good target for a little market research. Are we doing enough to familiarize new people with the way the game is played? What additional classes or sailing opportunities could we provide to get people over the threshold and into the sport? 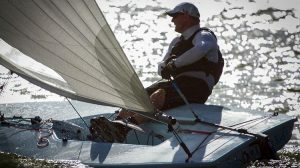 At one time, the club offered a “Challenger” fleet for new racers and put an experienced sailor on the boat for a while to help speed the orientation. It took a dedicated person to coordinate (Patty Rosky in that case), but it worked for a while. Could we have a non-scored race weekend (or race day at TTL) where leaders of fleets could help people new to the fleet to compete better and to introduce new people to the different boats? Unfortunately, there isn’t much that we can do to improve the wind. But what about the fleets? Skip Kempff rightly says that the strength of the club depends on the strength of the fleets. How do we work to build them? Are there too many fleets for the number of competitors? Does this dilute the racing? How could we funnel boats into certain fleets to reduce fragmentation? 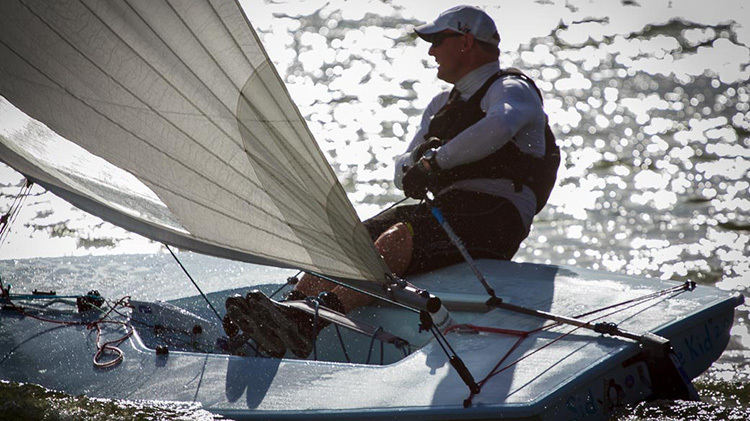 George Sheller would like to see us guide people into fewer types of one-design boats, perhaps C22, C14 and Laser. 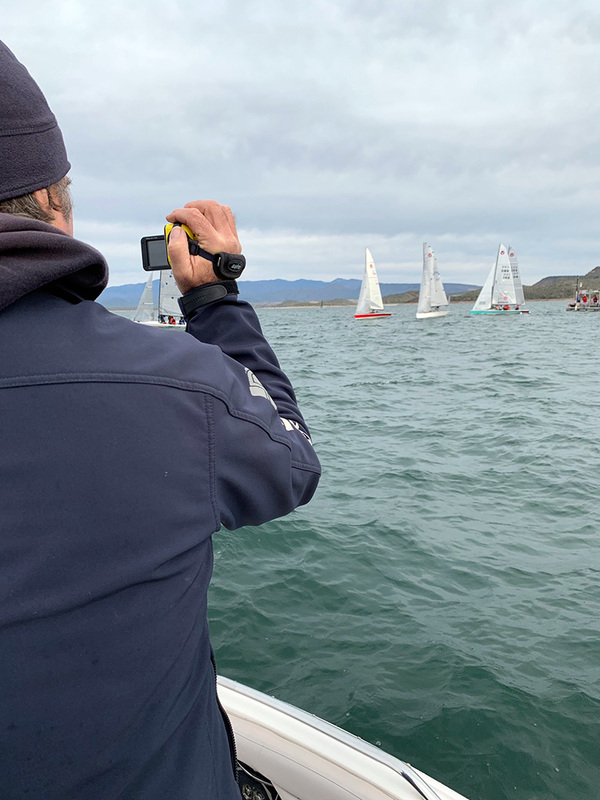 It’s unrealistic, he admits, to think that anyone would sell a PHRF boat to move into one of those fleets, but it might be possible to encourage newbies to go in that direction. Thistle, Laser, and Santana 20 (and formerly Buccs) have been aggressive about finding boats for potential skippers, even lending them boats to try them out. How could we support this effort? 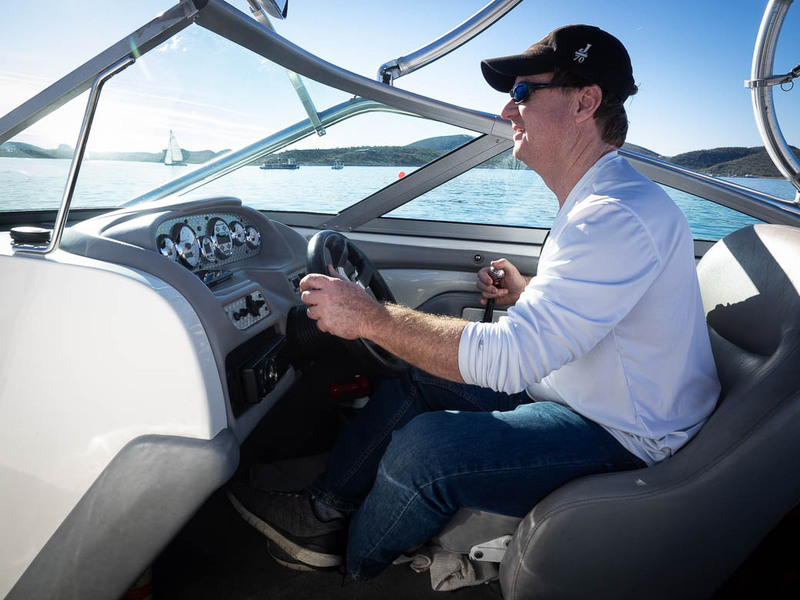 We also want to make sure there remains an avenue for those of us who enjoy higher-performance boats. What can we do to support the fleets in attracting new members? I hope this somewhat rambling essay can start the discussion. There are some specific steps we can take and others that will come from talking about it. All AYC members have now received an invoice for next year’s dues (or non-dues for Life and Honorary Life members) and the membership team hopes you’ll renew right away so we don’t have to send you the increasingly sad and pleading emails. The 2018-2019 dues are payable by July 1. If you plan not to renew your membership (you know, if you’ve been transferred to Fargo or something), please tell us that too. Life and Honorary Life members pay no dues, but we need you to update your contact information each year. Here’s a shot of some of those longtime AYC members, gathered together when former Commodore Joyce Seale visited from her New Zealand home. 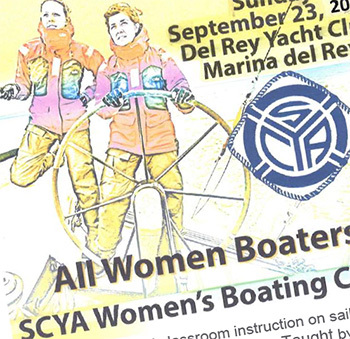 To join the national organization, US Sailing, or to renew your US Sailing membership, click here. 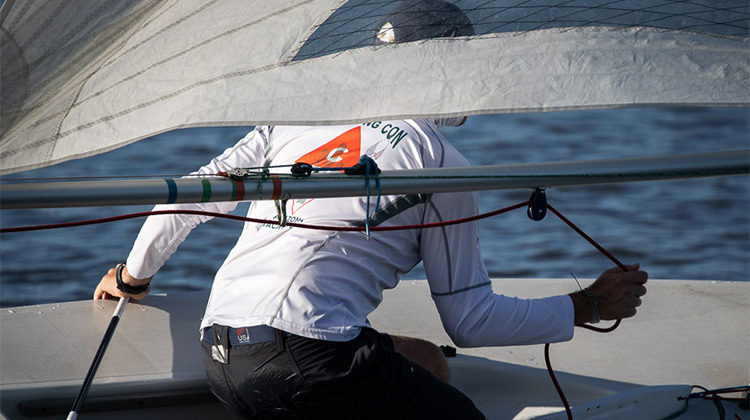 If you use this link to join or renew US Sailing, you get a lower rate and AYC gets a $10 credit to use for US Sailing materials or training. 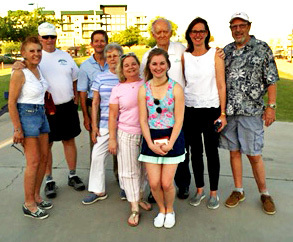 From left: Debi and Charlie Fife, Martin Lorch, Carol Ohlin, Mary Kay Farrington Lorch, Alexia Lorch, Tom Ohlin, Joyce Seale, and Dennis Lynde. Joyce says George Sheller was also there, but he was the only one actually out sailing. 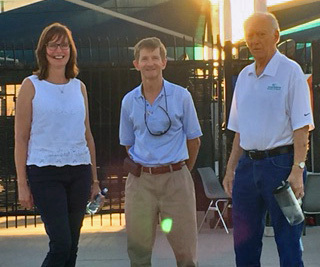 Former AYC Commodores Joyce Seale, Martin Lorch, and Tom Ohlin. Joyce and Tom are Honorary Life members. David Newland is the recipient of the AYC Most Valuable Player award, what we call the US Sailing Sportsmanship Award. 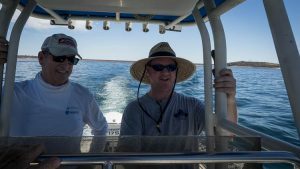 David has gone above and beyond constantly in his role as Lake Pleasant Lake Captain. I spent 45 minutes scanning a year’s worth of emails, hundreds of them, to try to give you a flavor of what he’s done and here’s just a glimpse of what I found. 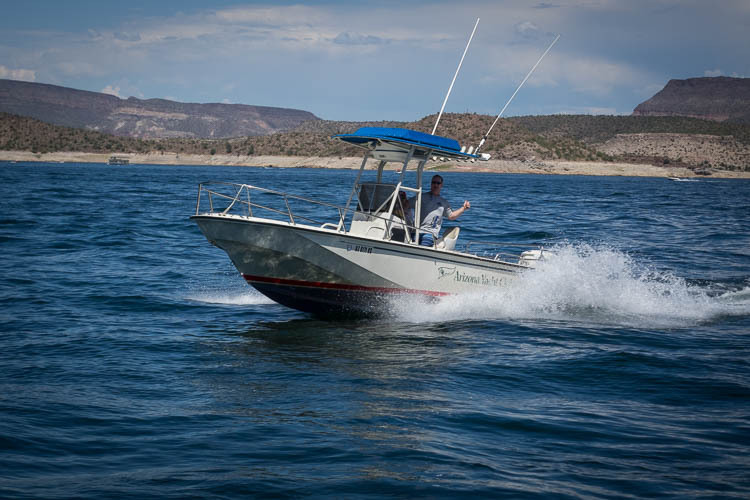 He researched a new outboard for the Boston Whaler, negotiated price with three dealers, arranged for the purchase, warranty (10-year), and installation… and even got us a little money for the old motor. 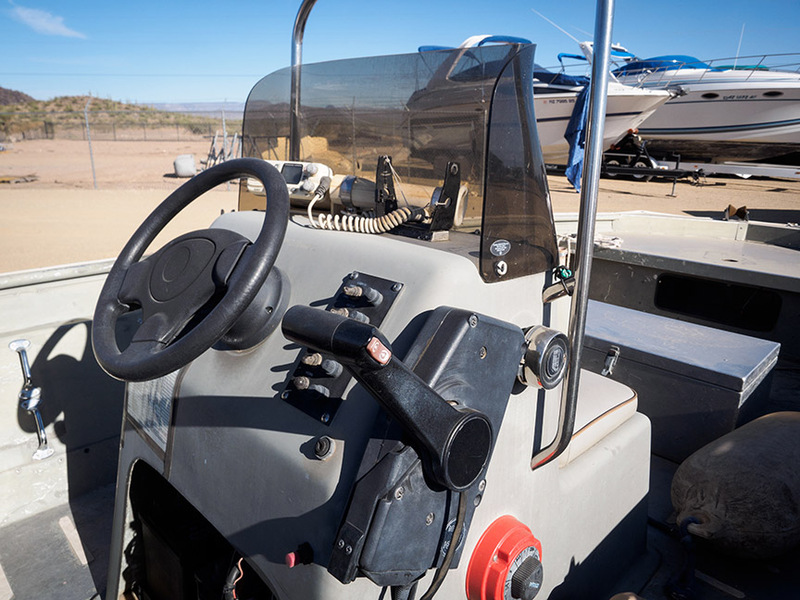 When the monsoon hit Pleasant Harbor Marina and the AYC pontoon boat went flying across the storage yard, smashing into a passing cruiser, the trailer and pontoon ending up bent and twisted, he arranged for repair, handled the insurance… and had some money left over. While he was at it, he personally redid the bunks on the trailer and replaced the brakes. Cleaned it up and rewired the control panel. Then there was replacing the automatic race starting boxes at both LP & TTL, the VHF radios, finding and sorting out the boat and trailer registrations, cleaning and sorting lines, writing checklists, working the mark anchors and rode and buckets, and cleaning out the lockers, sorting keys. He showed up at the beginning and end of every race day to make sure things were done correctly and then fixed them because they never were. Somewhere along the way the Commodore came up with a robotic race mark, the MarkSetBot that needed as much attention as a newborn baby and he handled most of that too. He did this when nobody was watching and not expecting any reward. 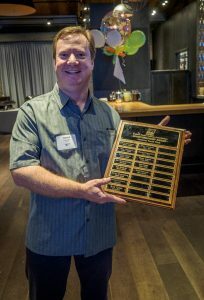 Our 2018 AYC MVP: David Newland. View from the cockpit of Red Stripe, with Carl Muehlenbeck. 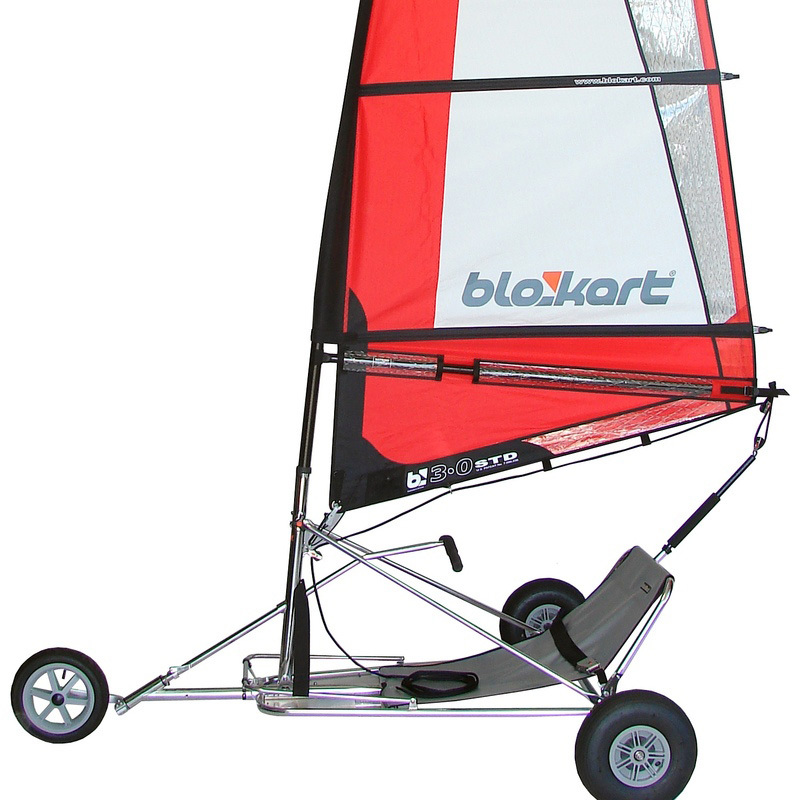 Fun sailing in a steady 10-15.